Eat. Live. Laugh. and sometimes shop! : Prepare to throw out the Toll House recipe. Chocolate Chip cookies may be my greatest weakness. Of course, dense chocolate cakes also cause me to loose all self control. And last night after eating a salad and swearing (inside my head) that I would not eat dessert, I . . . well, I couldn't say no to bread pudding with a warm Bourbon sauce. Really, as if you could?! Ok, well maybe some can. But I cannot. I simply think eating warm gooey desserts is a very crucial aspect of living la dolce vita. It is as crucial to my existence as water and wine. You think me dramatic, do you? Just ask my friends. They know. I am powerless in the face of desserts. Don't get me wrong. I can easily walk past the boxes of desserts and cakes in the grocery store. I can pass on desserts offered by most restaurants. I don't crave sugar. It is ooey gooey homemade goodness that makes me weak in the knees. And my achilles heel: chocolate. So, when I tout a chocolate chip recipe as "the best" I do not say this lightly. I do not like to build things up to the point where they can never meet expectations. Under promise, over deliver is my motto. But here I am throwing caution and all conventional wisdom to the wind. I am going out on the proverbial limb here and saying it loud and proud: THESE ARE THE BEST CHOCOLATE CHIP COOKIES EVER! Yes, now I'm screaming I'm so worked up about it. I will also point out that I am not alone in this opinion. Since I've adopting this recipe the comments from friends are clear: they are amazing. My kids are spoiled by chocolate chip cookies and even think Mrs. Field's cookies leave something to be desired. This recipe was originally provided to me by a friend via email with a notation that it was "Laura Bush's 2000 Presidential Election cookie recipe". I have tried to verify such online but all the recipes I find vary from this (most include cinnamon). I have also made numerous tweaks over the years to fine-tune it a bit. I have never added pecan pieces. I find them distracting in desserts. I did for a time add the coconut and then only 1/2 the coconut, but now I don't add any coconut. It does provide moisture to the cookie which is nice and my kids never complained. I simply prefer the cake-y cookie texture that develops without the coconut. All personal preference. I have also tried every chocolate chip on the market. Nestle semi-sweet is the standard in chocolate chip cookies and they are great -- neither too sweet nor too dark. I, however, prefer darker chocolate. 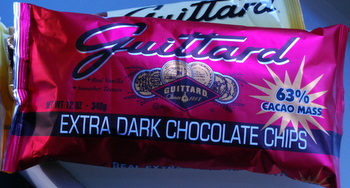 Besides the obvious health benefits of dark chocolate (see my rationalization), I simply prefer the more intense flavor, so I bake with Guittard's Extra Dark Chocolate Chips. Try them and let me know what you think, but be prepared. The bar will be raised and expectations will be set. Simply put: the Toll House recipe may never suffice again. 2 cups flour + 1 tbsp. Slowly add flour mixture to the sugar mixture a little at a time until just incorporated. Bake for 12-15 minutes. Remove from oven when just golden brown and allow to rest for a minute or two on cookie sheet before moving to cooling rack. Enjoy. I'm setting out some butter right now! I'm def. gonna try with my girls:) thanks! I'll be trying these! I love dark chocolate. I seriously just ate a bucket of chocolate chip cookie dough. I'll have to make this next :). I'm trying these this weekend without a doubt! Thanks so much! do you hate me and want to make me fat?! DO YOU?! you KNOW i have no self-control and yet you still put this within easy access. i question your friendship. Ali - B & B will attest: these are worth a few extra pounds. And FYI, if you gained 5 lbs some of your friends will actually stop hating you. See, I am actually quite a good friend. Oooo. I have never heard of those chips, but I love that recipe! Thanks for the tip. I just found your blog! Super cute! Yea! So glad you tried them and liked them! !